ManBabies is a phenomenon turned to art. Although it may seem awkward at first, the unusual photos will turn your one of a kind memories into more artistic ones. Lately, photographer Paul Ripke added a personal touch to the idea. How many of you want to turn back time a and be children again? No worries, the infinite number of possibilities, the world unwrapping endlessly before your eyes, the life just beginning…what would you say if we were to tell you that you can be a child again? And still keep your brains just the way they are? This is far from being just a fairytale. It’s ManBabies. And for the ladies, it’s Paul Ripke. Paul Ripke is a German photographer. That photography is an art by itself, there is no doubt in our days. But Ripke didn’t settle to just immortalize the wonders of nature – human or non-human. He took family portrays to a whole new level, adding a persona view to the already existing ManBabies phenomenon. 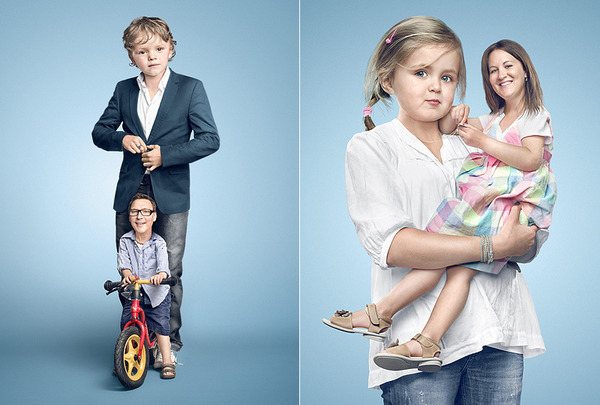 What is particular about it is that the heads of the adults and babies in the photos are inversed in such a way that, far from being hideous, they are funny and kind of cool. Check out some of the photos. As we said, ManBabies was not invented by Paul Ripke; the phenomenon was already born, since 2009. Ripke gave a “professional makeover” to the idea, adding women faces in the mix. His first tryouts were his neighbours, local restaurant owners and a well known German DJ. They all posed for the photo shootings. Keeping a bit of the creepy sensation, the photos turned out hilarious. Feel young again! Be young again!